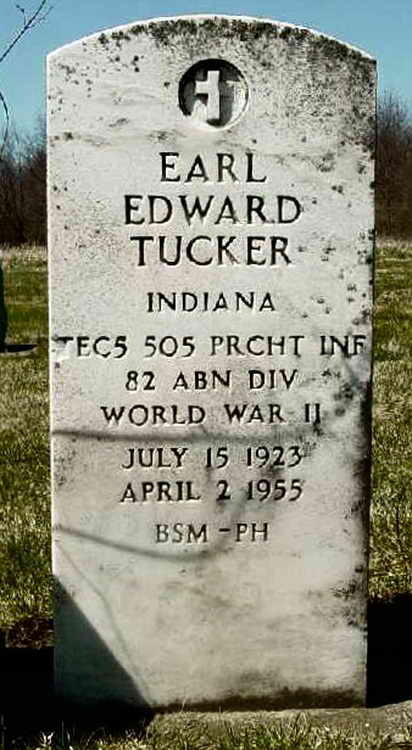 Grave marker for Earl Edward Tucker in Section 12, Lot: 15, Space: 4 of the Russiaville Cemetery, Russiaville (Howard County), Indiana. Earl enlisted at Fort Benjamin Harrison, IN, on October 24, 1942 and volunteered for parachutist duty. He was assigned to the 508th and sent to Camp Blanding, FL where the regiment had just been activated. He remained a member of the 508th in 1942 and 1943 but was transferred to the 505th.